[Bing Bong] The sound bite heralded Leslie joining the regular Improvement Science mentoring session with Bob. They were now using web-technology to run virtual meetings because it allows a richer conversation and saves a lot of time. It is a big improvement. <Bob> Hi Lesley, how are you today? <Leslie> OK thank you Bob. I have a thorny issue to ask you about today. It has been niggling me even since we started to share the experience we are gaining from our current improvement-by-design project. <Bob> OK. That sounds interesting. Can you paint the picture for me? <Leslie> Better than that – I can show you the picture, I will share my screen with you. <Bob> OK. I can see that RAG table. Can you give me a bit more context? <Leslie> Yes. This is how our performance management team have been asked to produce their 4-weekly reports for the monthly performance committee meetings. <Bob> OK. I assume the “Period” means sequential four week periods … so what is Count, Fail and Fail%? <Leslie> Count is the number of discharges in that 4 week period, Fail is the number whose length of stay is longer than the target, and Fail% is the ratio of Fail/Count for each 4 week period. <Bob> It looks odd that the counts are all 28. Is there some form of admission slot carve-out policy? <Leslie> Yes. There is one admission slot per day for this particular stream – that has been worked out from the average historical activity. <Bob> Ah! And the Red, Amber, Green indicates what? 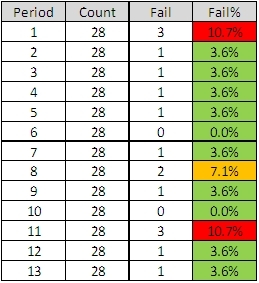 <Leslie> That is depends where the Fail% falls in a set of predefined target ranges; less than 5% is green, 5-10% is Amber and more than 10% is red. <Bob> OK. So what is the niggle? <Leslie>Each month when we are in the green we get no feedback – a deafening silence. Each month we are in amber we get a warning email. Each month we are in the red we have to “go and explain ourselves” and provide a “back-on-track” plan. <Bob> Let me guess – this feedback design is not helping much. <Leslie> It is worse than that – it creates a perpetual sense of fear. The risk of breaching the target is distorting people’s priorities and their behaviour. <Bob> Do you have any evidence of that? <Leslie> Yes – but it is anecdotal. There is a daily operational meeting and the highest priority topic is “Which patients are closest to the target length of stay and therefore need to have their discharge expedited?“. <Bob> Ah yes. The “target tail wagging the quality dog” problem. So what is your question? <Leslie> How do we focus on the cause of the problem rather than the symptoms? We want to be rid of the “fear of the stick”. <Bob> OK. What you have hear is a very common system design flaw. It is called a DRAT. <Bob> “Delusional Ratio and Arbitrary Target”. <Leslie> Ha! That sounds spot on! “DRAT” is what we say every time we miss the target! <Bob> Indeed. 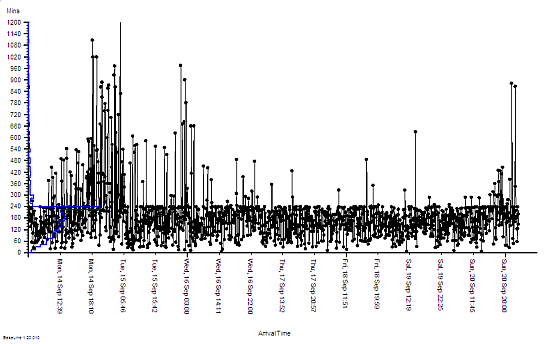 So first plot this yield data as a time series chart. <Bob>Good. I see you have added the cut-off thresholds for the RAG chart. These 5% and 10% thresholds are arbitrary and the data shows your current system is unable to meet them. Your design looks incapable. <Leslie>Yes – and it also shows that the % expressed to one decimal place is meaningless because there are limited possibilities for the value. <Bob> Yes. These are two reasons that this is a Delusional Ratio; there are quite a few more. 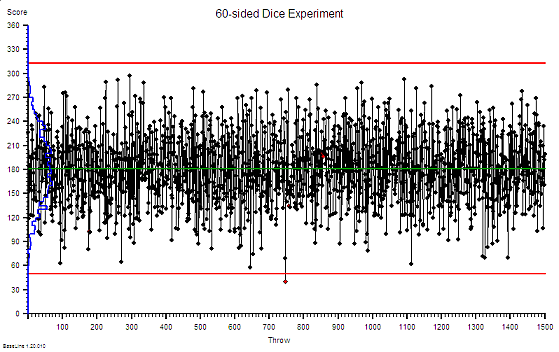 <Leslie> OK and if I plot this as an Individuals charts I can see that this variation is not exceptional. <Bob> Careful Leslie. It can be dangerous to do this: an Individuals chart of aggregate yield becomes quite insensitive with aggregated counts of relatively rare events, a small number of levels that go down to zero, and a limited number of points. The SPC zealots are compounding the problem and plotting this data as a C-chart or a P-chart makes no difference. This is all the effect of the common practice of applying an arbitrary performance target then counting the failures and using that as means of control. It is poor feedback loop design – but a depressingly common one. <Leslie> So what do we do? What is a better design? <Bob> First ask what the purpose of the feedback is? 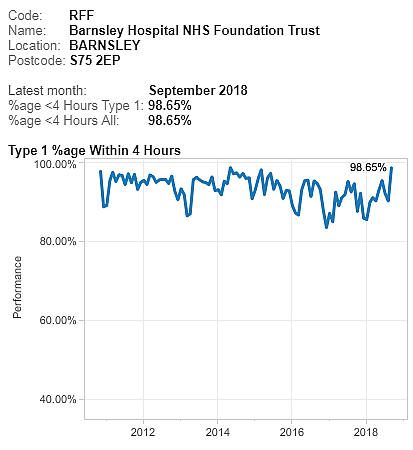 <Leslie> To reduce the number of beds and save money by forcing down the length of stay so that the bed-day load is reduced and so we can do the same activity with fewer beds and at the same time avoid cancellations. <Bob> OK. That sounds reasonable from the perspective of a tax-payer and a patient. It would also be a more productive design. <Leslie> I agree but it seems to be having the opposite effect. 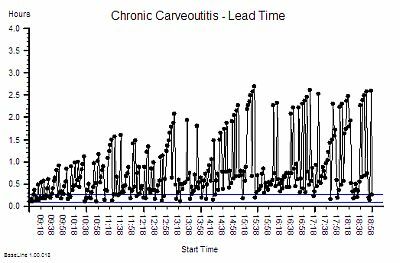 We are focusing on avoiding breaches so much that other patients get delayed who could have gone home sooner and we end up with more patients to expedite. It is like a vicious circle. And every time we fail we get whacked with the RAG stick again. It is very demoralizing and it generates a lot of resentment and conflict. That is not good for anyone – least of all the patients. <Bob>Yes. That is the usual effect of a DRAT design. Remember that senior managers have not been trained in process improvement-by-design either so blaming them is also counter-productive. We need to go back to the raw data. 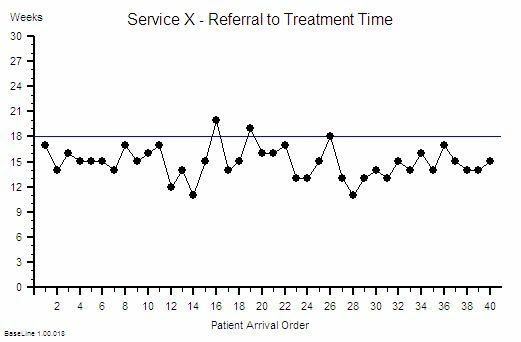 Can you plot actual LOS by patient in order of discharge as a run chart. 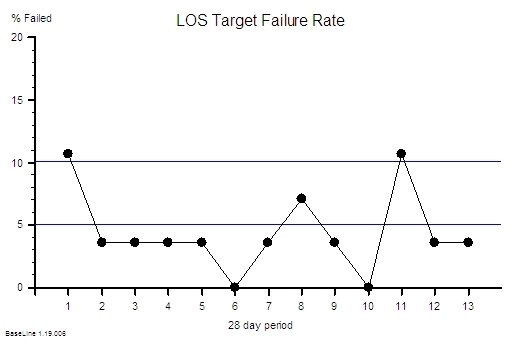 <Bob> OK – is the maximum LOS target 8 days? <Leslie> Yes – and this shows we are meeting it most of the time. But it is only with a huge amount of effort. <Bob> Do you know where 8 days came from? 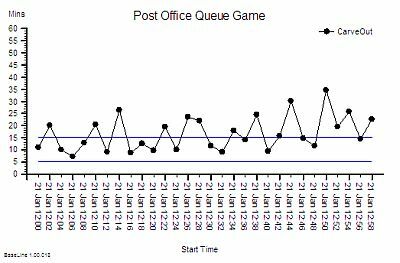 <Leslie> I think it was the historical average divided by 85% – someone read in a book somewhere that 85% average occupancy was optimum and put 2 and 2 together. <Bob> Oh dear! The “85% Occupancy is Best” myth combined with the “Flaw of Averages” trap. Never mind – let me explain the reasons why it is invalid to do this. 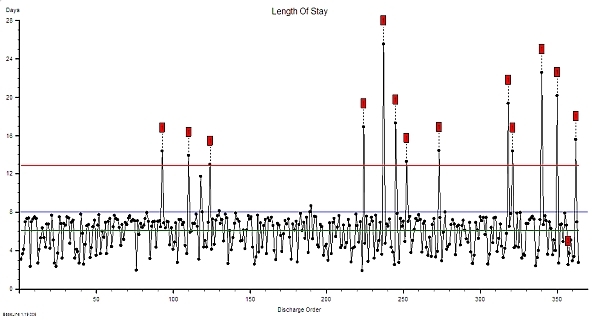 <Bob> First plot the data as a run chart and as a histogram – do not plot the natural process limits yet as you have done. We need to do some validity checks first. <Bob> What do you see? <Leslie> The histogram has more than one peak – and there is a big one sitting just under the target. <Bob>Yes. This is called the “Horned Gaussian” and is the characteristic pattern of an arbitrary lead-time target that is distorting the behaviour of the system. Just as you have described subjectively. 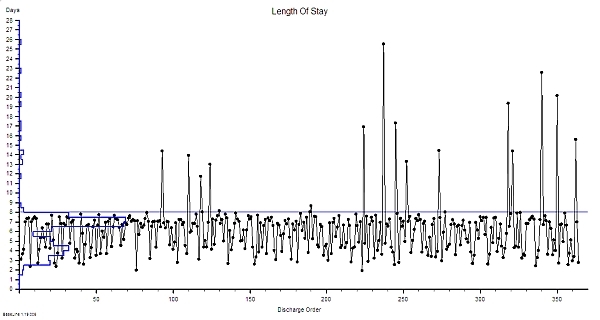 There is a smaller peak with a mode of 4 days and are a few very long length of stay outliers. This multi-modal pattern means that the mean and standard deviation of this data are meaningless numbers as are any numbers derived from them. It is like having a bag of mixed fruit and then setting a maximum allowable size for an unspecified piece of fruit. Meaningless. <Leslie> And the cases causing the breaches are completely different and could never realistically achieve that target! So we are effectively being randomly beaten with a stick. That is certainly how it feels. <Bob> They are certainly different but you cannot yet assume that their longer LOS is inevitable. This chart just says – “go and have a look at these specific cases for a possible cause for the difference“. <Leslie> OK … so if they are from a different system and I exclude them from the analysis what happens? <Bob> It will not change reality. The current design of this process may not be capable of delivering an 8 day upper limit for the LOS. Imposing a DRAT does not help – it actually makes the design worse! As you can see. Only removing the DRAT will remove the distortion and reveal the underlying process behaviour. <Leslie> So what do we do? There is no way that will happen in the current chaos! <Bob> Apply the 6M Design® method. Map, Measure and Model it. Understand how it is behaving as it is then design out all the causes of longer LOS and that way deliver with a shorter and less variable LOS. Your chart shows that your process is stable. 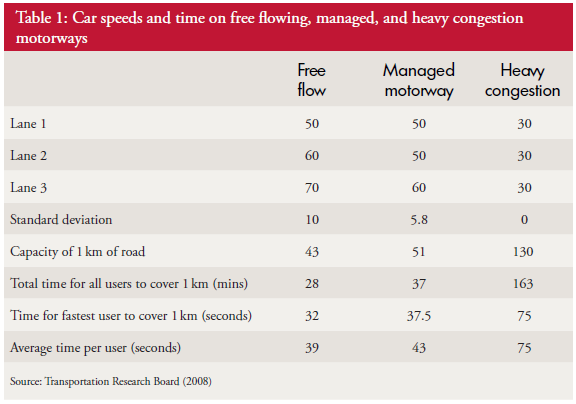 That means you have enough flow capacity – so look at the policies. Draw on all your FISH training. That way you achieve your common purpose, and the big nasty stick goes away, and everyone feels better. And in the process you will demonstrate that there is a better feedback design than DRATs and RAGs. A win-win-win design. <Leslie> OK. That makes complete sense. Thanks Bob! But what you have described is not part of the FISH course. <Bob> You are right. It is part of the ISP training that comes after FISH. Improvement Science Practitioner. <Leslie> I think we will need to get a few more people trained in the theory, techniques and tools of Improvement Science. <Bob> That would appear to be the case. They will need a real example to see what is possible. <Leslie> OK. I am on the case! Posted in 6M Design, BaseLine, Bob&Les, Carveout, Design, Examples, FISH, Flow, Reflections, Stories, Three Wins, Training | Comments Off on DRAT! There seems to be a natural cycle to change and improvement. A pace that feels right and that works well. Try to push faster and resistance increases. Relax and pull slower and interest wanders. The pace that feels about right is a six week cycle. So why six weeks? Is it 42 days that is important or it there something about a seven-day week and the number six? The daily and the weekly cycles are dictated by the Celestial Clockwork. The day is the Earth’s rotation and the week is one quarter if the 28 day Lunar cycle. These are not arbitrary policies – they are celestial physics. Not negotiable. So where does the Six come from? That does seem to be something to do with people and psychology. The predictable sequence of emotional states that accompanies significant change? The sequence of Shock-Denial-Anger-Bargaining-Depression-Resolution? It has six stages. Is that just a co-incidence? The required sequence of steps that structure any improvement-by-design challenge? It has six stages. Is that just a co-incidence too? And is seven days a convenient size? It was originally six-days-of-work and one-day-of-rest. The modern 5-and-2 design is a recent invention. 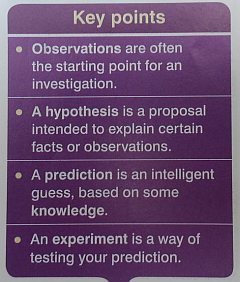 And if each stage requires at least one week to complete and we require six stages then we get a Six Week cycle. It sounds lie a plausible hypothesis but is that what happens in reality? There is a lot of empirical evidence to suggest that it does. It seems we feel comfortable working with six-week chunks of time. We plan about six weeks ahead. School terms are divided into about six week chunks. A financial “quarter” is about two chunks. We can fit four of those into a Year with a bit left over. 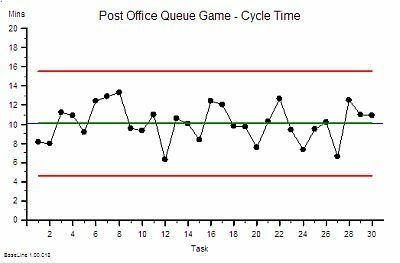 Action learning seems to work well in six week cycles. 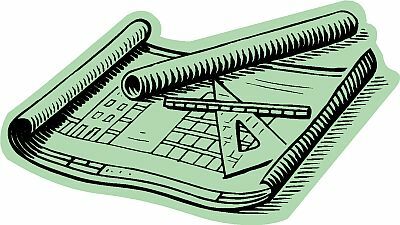 Courses are very often carved up into six week modules. It feels OK. So what does this mean for the Improvement Scientist? First it suggests that doing something every week makes sense. Leaving it all to the last minute does not. Second it suggests that each week the step required and the emotional reaction is predictable. Third it suggests that five weeks of facilitative investment are required. 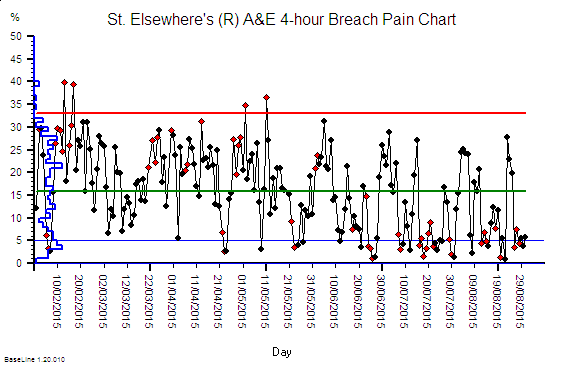 Fourth it suggests that if something throws a spanner into the sequence the we need to add extra weeks. And it suggests that in the Seventh Week we can rest, reflect, share and prepare for the next Six Week change cycle. So maybe Douglas Adams was correct – the Answer to Life the Universe and Everything is Forty Two. It does not seem to take much to bring a real system to an almost standstill. Six inches of snow falling between 10 AM and 2 PM in a Friday in January seems to be enough! It was not so much the amount of snow – it was the timing. The decision to close many schools was not made until after the pupils had arrived – and it created a logistical nightmare for parents. Many people suddenly needed to get home before they expected which created an early rush hour and gridlocked the road system. The same number of people travelled the same distance in the same way as they would normally – it just took them a lot longer. And the queues created more problems as people tried to find work-arounds to bypass the traffic jams. How many thousands of hours of life-time was wasted sitting in near-stationary queues of cars? How many millions of poundsworth of productivity was lost? How much will the catchup cost? Actually we do not have to. And we do not need a weather machine to control the weather. Mother Nature is what it is. Exactly the same behaviour happens in many systems – and our conclusion is the same. We assume the chaos and queues are inevitable. They are symptoms of the system design – and specifically they are the inevitable outcomes of the time-design. But it is tricky to visualise the time-design of a system. We can see the manifestations of the poor time-design, the queues and chaos, but we do not so easily perceive the causes. So the poor time-design persists. We are not completely useless though; there are lots of obvious things we can do. We can devise ingenious ways to manage the queues; we can build warehouses to hold the queues; we can track the jobs in the queues using sophisticated and expensive information technology; we can identify the hot spots; we can recruit and deploy expediters, problem-solvers and fire-fighters to facilitate the flow through the hottest of them; and we can pump capacity and money into defences, drains and dramatics. And our efforts seem to work so we congratulate ourselves and conclude that these actions are the only ones that work. And we keep clamouring for more and more resources. More capacity, MORE capacity, MORE CAPACITY. Until we run out of money! And then we have to stop asking for more. And then we start rationing. And then we start cost-cutting. And then the chaos and queues get worse. And all the time we are not aware that our initial assumptions were wrong. The chaos and queues are not inevitable. They are a sign of the time-design of our system. So we do have other options. We can improve the time-design of our system. We do not need to change the safety-design; nor the quality-design; nor the money-design. Just improving the time-design will be enough. For now. Before we explore that we need to demonstrate What is possible. How big is the prize? The class of system design problem that cause particular angst are called mixed-priority mixed-complexity crossed-stream designs. We encounter dozens of them in our daily life and we are not aware of it. One of particular interest to many is called a hospital. The mixed-priority dimension is the need to manage some patients as emergencies, some as urgent and some as routine. The mixed-complexity dimension is that some patients are easy and some are complex. The crossed-stream dimension is the aggregation of specialised resources into departments. Expensive equipment and specific expertise. 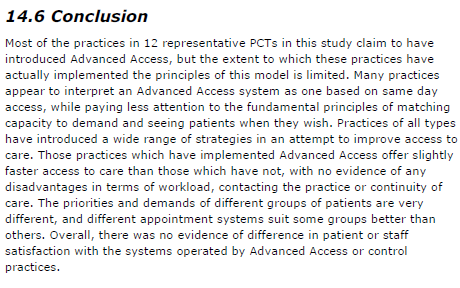 We then attempt to push patients with different priorites long different paths through these different departments . And it is a management nightmare! Our usual and “obvious” response to this challenge is called a carve-out design. And that means we chop up our available resource capacity into chunks. And we do that in two ways: chunks of time and chunks of space. We try to simplify the problem by dissecting it into bits that we can understand. We separate the emergency departments from the planned-care facilities. We separate outpatients from inpatients. We separate medicine from surgery – and we then intellectually dissect our patients into organ systems: brains, lungs, hearts, guts, bones, skin, and so on – and we create separate departments for each one. Neurology, Respiratory, Cardiology, Gastroenterology, Orthopaedics, Dermatology to list just a few. And then we become locked into the carve-out design silos like prisoners in cages of our own making. And so it is within the departments that are sub-systems of the bigger system. Simplification, dissection and separation. Ad absurdam. The major drawback with our carve-up design strategy is that it actually makes the system more complicated. The number of necessary links between the separate parts grows exponentially. And each link can hold a small queue of waiting tasks – just as each side road can hold a queue of waiting cars. The collective complexity is incomprehensible. The cumulative queue is enormous. The opportunity for confusion and error grows exponentially. 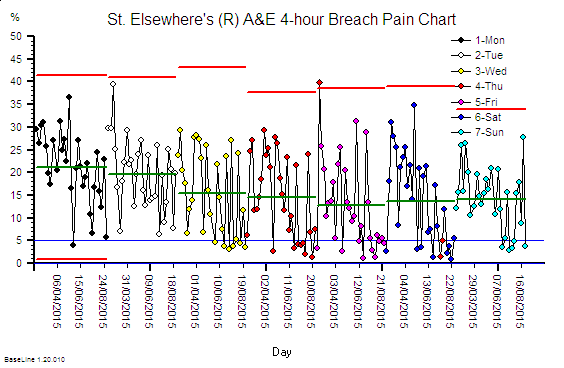 Safety and quality fall and cost rises. Carve-out is an inferior time-design. But our goal is correct: we do need to simplify the system so that means simplifying the time-design. To illustrate the potential of this ‘simplify the time-design’ approach we need a real example. One way to do this is to create a real system with lots of carve-out time-design built into it and then we can observe how it behaves – in reality. 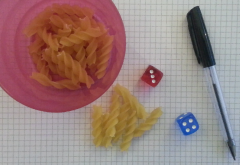 A carefully designed Table Top Game is one way to do this – one where the players have defined Roles and by following the Rules they collectively create a real system that we can map, measure and modify. With our Table Top Team trained and ready to go we then pump realistic tasks into our realistic system and measure how long they take in reality to appear out of the other side. 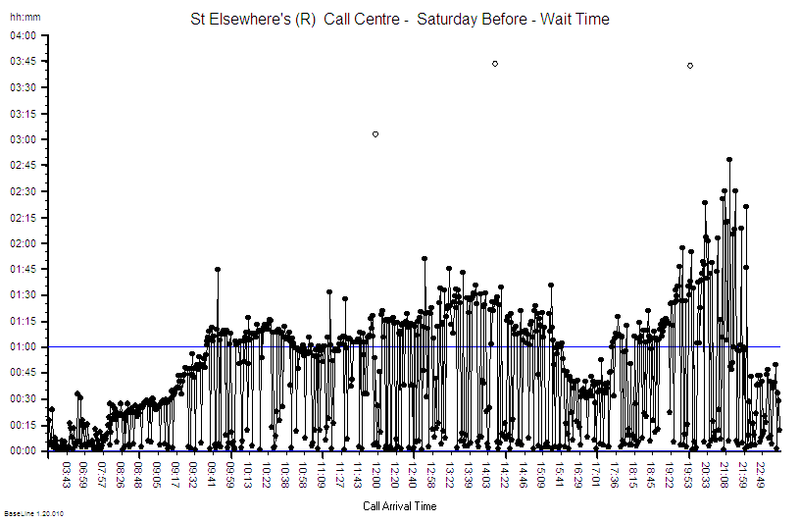 And we then use the real data to plot some real time-series charts. Not theoretical general ones – real specific ones. 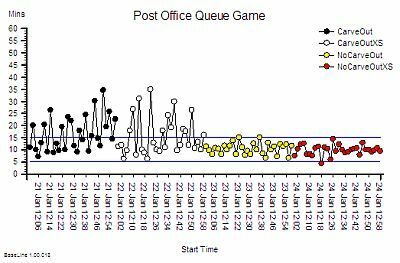 And then we use the actual charts to diagnose the actual causes of the actual queues and actual chaos. 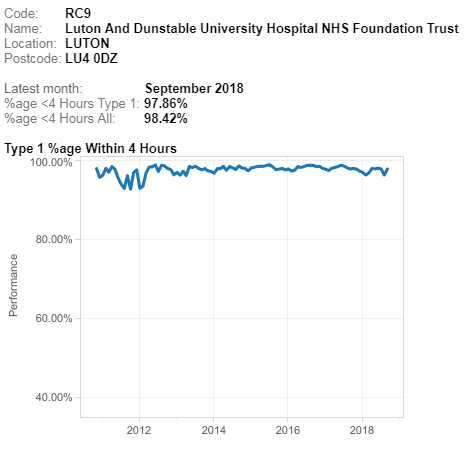 This is the time-series chart of a real Time-Design Game that has been designed using an actual hospital department and real observation data. Which department it was is not of importance because it could have been one of many. Carve-out is everywhere. There was a mix of priority: some tasks were more urgent than others. There was a mix of complexity: some tasks required more steps that others. The paths crossed at separate steps where different people did defined work using different skills and special equipment. There were handoffs between all of the steps on all of the streams. There were lots of links. There were many queues. There were ample opportunities for confusion and errors. But the design of the real process was such that the work was delivered to a high quality – there were very few output errors. The yield was very high. The design was effective. The resources required to achieve this quality were represented by the hours of people-time availability – the capacity. The cost. And the work was stressful, chaotic, pressured, and important – so it got done. Everyone was busy. Everyone pulled together. They helped each other out. They were not idle. They were a good team. The design was efficient. 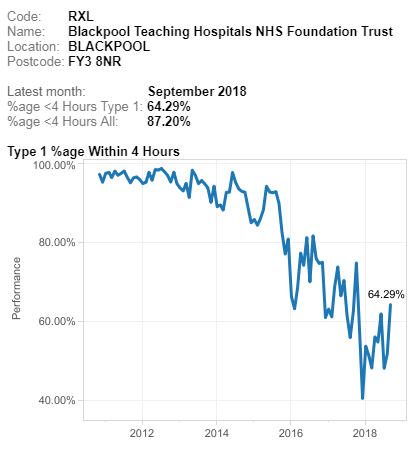 The thin blue line on the time-series chart is the “time target” set by the Organisation. But the effective and efficient system design only achieved it 77% of the time. So the “obvious” solution was to clamour for more people and for more space and for more equipment so that the work can be done more quickly to deliver more jobs on-time. Unfortunately the Rules of the Time-Design Game do not allow this more-money option. There is no more money. To succeed at the Time-Design Game the team must find a way to improve their delivery time performance with the capacity they have and also to deliver the same quality. But this is impossible! If it were possible then the solution would be obvious and they would be doing it already. No one can succeed on the Time-Design Game. Wrong. It is possible. And the assumption that the solution is obvious is incorrect. The solution is not obvious – at least to the untrained eye. 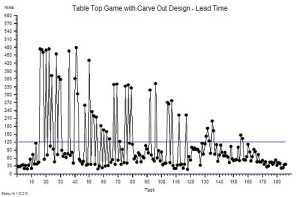 To the trained eye the time-series chart shows the characteristic signals of a carve-out time-design. The high task-to-task variation is highly suggestive as is the pattern of some of the earlier arrivals having a longer lead time. 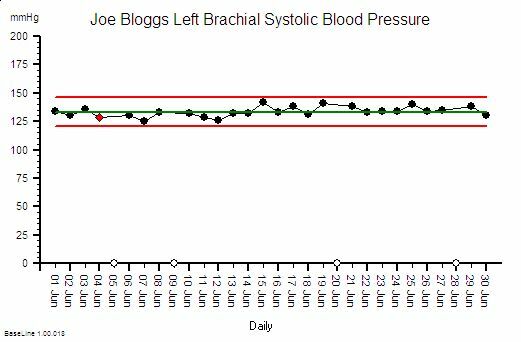 An experienced system designer can diagnose a carve-out time-design from a set of time-series charts of a process just as a doctor can diagnose the disease from the vital signs chart for a patient. 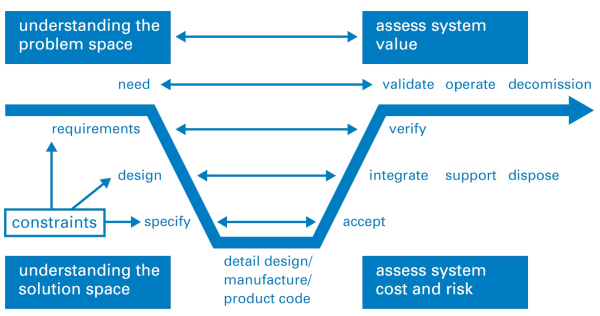 And when the diagnosis is confirmed with a verification test then the time-Redesign phase can start. This chart shows what happened after the time-design of the system was changed – after some of the carve-out design was modified. 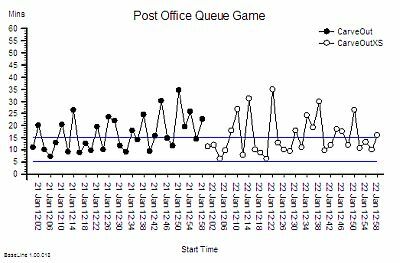 The Y-axis scale is the same as before – and the delivery time improvement is dramatic. 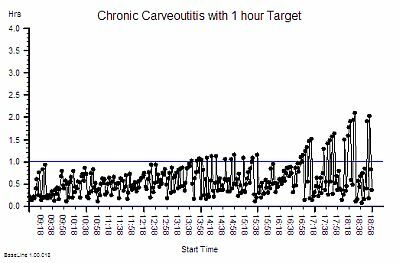 The Time-ReDesigned system is now delivering 98% achievement of the “on time target”. The important thing to be aware of is that exactly the same work was done, using exactly the same steps, and exactly the same resources. No one had to be retrained, released or recruited. The quality was not impaired. And the cost was actually less because less overtime was needed to mop up the spillover of work at the end of the day. And the Time-ReDesigned system feels better to work in. It is not chaotic; flow is much smoother; and it is busy yet relaxed and even fun. The same activity is achieved by the same people doing the same work in the same sequence. Only the Time-Design has changed. A change that delivered a win for the workers! 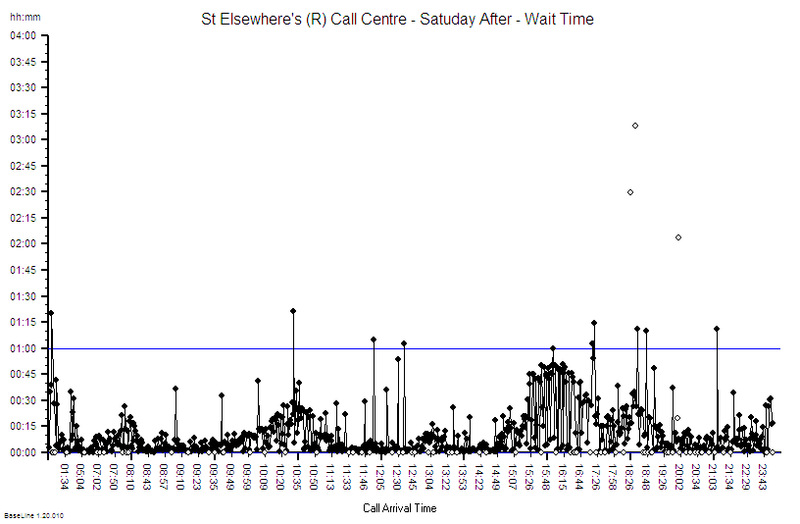 What was the impact of this cost-saving improvement on the customers of this service? They can now be 98% confident that they will get their task completed correctly in less than 120 minutes. Before the Time-Redesign the 98% confidence limit was 470 minutes! So this is a win for the customers too! And the Time-ReDesigned system is less expensive so it is a win for whoever is paying. Same safety and quality, quicker with less variation, and at lower cost. Win-Win-Win. And the usual reaction to playing the Time-ReDesign Game is incredulous disbelief. Some describe it as a “light bulb” moment when they see how the diagnosis of the carve-out time-design is made and and how the Time-ReDesign is done. They say “If I had not seen it with my own eyes I would not have believed it.” And they say “The solutions are simple but not obvious!” And they say “I wish I had learned this years ago!” And thay apologise for being so skeptical before. And there are those who are too complacent, too careful or too cynical to play the Time-ReDesign Game (which is about 80% of people actually) – and who deny themselves the opportunity of a win-win-win outcome. And that is their choice. They can continue to grin and bear it – for a while longer. 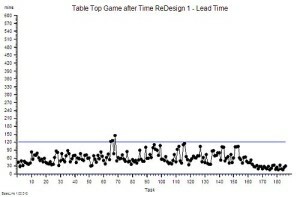 And for the 20% who want to learn how to do Time ReDesign for real in their actual systems there is now a Ray Of Hope. And the Ray of Hope is illuminating a signpost on which is written “This Way to Improvementology“.